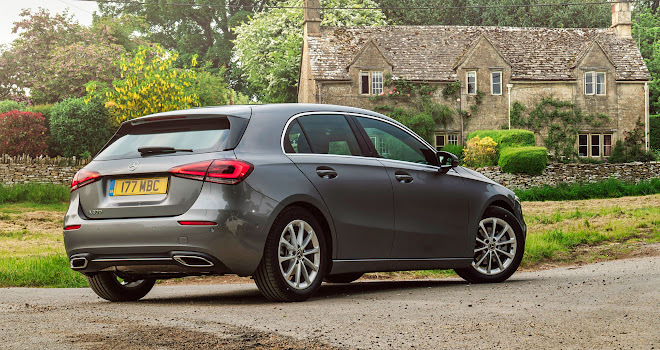 I can only assume that a small army of German stonemasons must have been made redundant as a result of the new fourth-generation Mercedes A-Class. The previous edition provided the kind of ride that must surely have involved suspension components chiselled from solid blocks of granite. 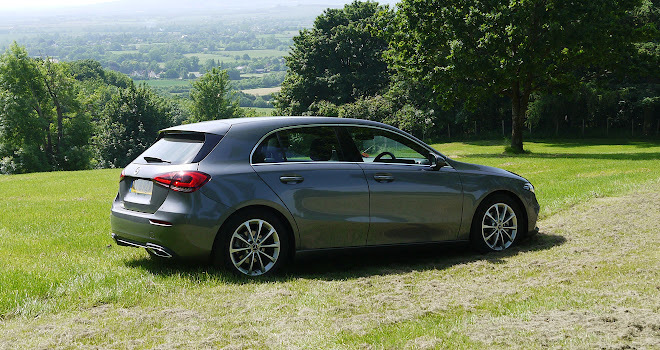 Happily for those of us not employed in the rock crafting business, the new A-Class appears to have acquired flexible springs and dampers, cushioning the jolts between the road and your bottom. This is true even in the AMG Line version, with its sportier setup and 18-inch wheels. The supple, flowing way it whips along a rough road came as the biggest surprise in a long day spent testing the newest baby Benz. That and the lack of interior trim rattles, which in the past always seemed to follow me into the cabin of pretty much every small Mercedes I ever sampled. Two different examples of the new generation proved equally immune to squeaks and jitters, as if all the previously loose bits of trim had been hunted down and tightened up, greased, or swaddled in cotton wool as part of the comprehensive redesign. Or indeed as if the cabin were no longer being continually shaken to pieces on rock hard springs. The A-Class has also become a bit of a smoothie on the outside as well. The prior car was a busy looking thing, with sinuous creases rushing in all directions along its flanks. The new car retains roughly the same theme but has calmed down immeasurably. The nose is a little lower than before, the grille is wider, the lamps are slimmer, the bonnet is longer and the front overhang has shrunk just a little bit. The standard wheel size has also gone up by an inch, while the whole car is a fraction longer and wider. All of these small dimensional shifts gel together to provide a much better looking result, to my eyes at least. Inside, the cabin has undergone a similarly thorough reinvention. Most noticeable is the dramatic change to the instrument cluster, which no longer sits huddled within a recessed shroud but juts up vertically from the dashboard. This digital instrument panel is joined to the central touchscreen so that the two form a single flush surface sweeping out from behind the windscreen and into the middle of the car. In top-spec AMG Line models, twin 10.3-inch screens look fabulous, sitting behind a single flush glazed surface. An entry level SE version I tried looked slightly less impressive, however, with two smaller, squarer, 7-inch screens recessed behind swathes of piano black bezel that seemed destined to collect a fresco of fingerprints. Pick the mid-range Sport trim instead and there’s the option to upgrade one or both of the screens. The rest of the cabin is a very pleasing place to sit, with comfortable seats, a spacious feel, high quality materials and smoothly moving controls. The plethora of circular air vents all swivel with satisfying precision. I can’t say controls felt logically laid out, because I spent most of the morning playing hunt-the-handbrake in the new A-Class. 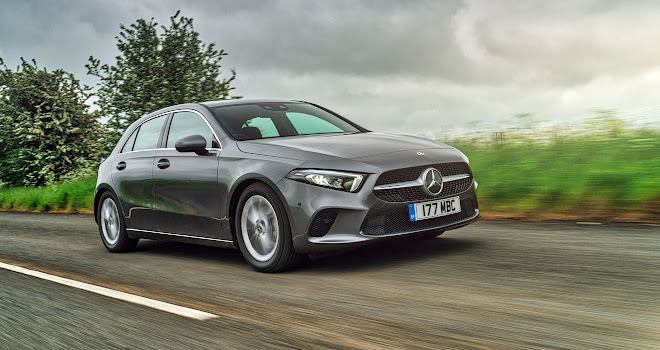 Eventually I gave up and asked: it has migrated even from the odd positions typically chosen by Mercedes, and has become a small electronic flap lurking next to the headlight selector, out of sight close to the steering column shroud. The transmission stick, meanwhile, lives where most other manufacturers put the wiper stalk. You would, I suppose, quickly acclimatise to these layout foibles. 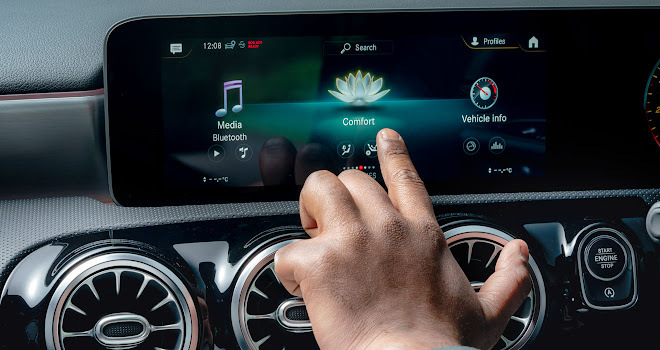 The most arresting feature of the new A-Class is its digital interactive system, called MBUX, which is by turns both highly impressive and a mite frustrating. On the plus side, the on-screen graphics are very slickly rendered, and interaction quickly feels as familiar as using a smartphone. There’s also the welcome option to create favourite items for controls you might access often, and selectable personal profiles to switch between multiple driver preferences in a jiffy. On the down side, it is all rather fiendishly complicated, particularly in the number of options offered. 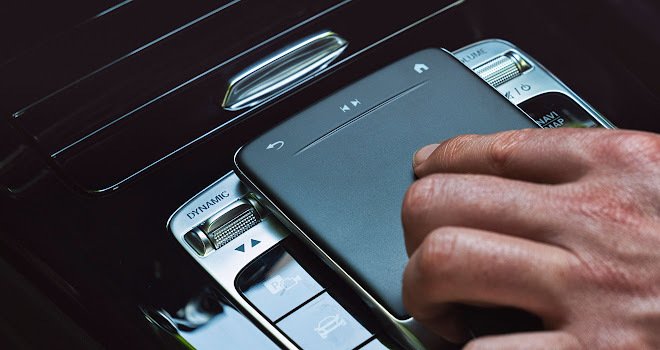 For example, the centre screen can be governed directly by touch, remotely via a centre console trackpad, or equally remotely by a tiny optical trackpad on the steering wheel, designed to be operated with your thumb. 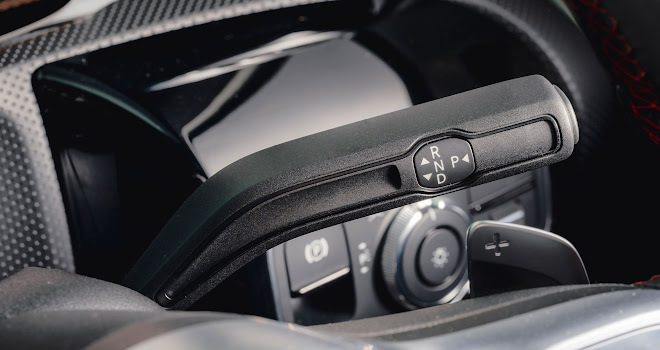 In fact there are two thumb trackers on the wheel, one to control the centre screen and the other for the instrument cluster. Both come with their own “back” and “home” keys, so there are two of each on the wheel, plus another pair above the main trackpad and then soft-key versions on-screen. There is also the option of voice control, offering a fourth method of accessing the MBUX functions. The system is set to listen all the time by default, so it can be woken by saying “Hey Mercedes” aloud. It will them help in various semi-intelligent ways, for example by turning up the heating if you announce you’re cold, or finding the nearest cafe if you ask where you can stop for coffee. 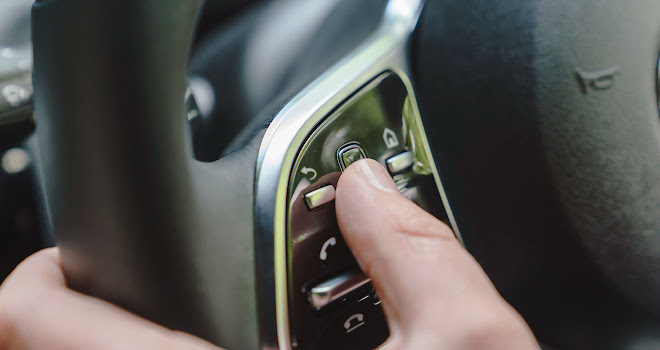 Some potential commands have been disabled on safety grounds – you can’t, for example, switch traction control off by voice. Similarly, telling the car to roll down all its windows has been disallowed, to discourage children from shouting out amusing instructions in the middle of a car-wash.
You can also ask MBUX to tell you a joke, though I can’t guarantee you’ll laugh at its response. Most of the time the voice system does reasonably well, especially with simple in-car actions, but I also found some surprising gaps in its repertoire. Asked, “Hey Mercedes, how far is it to Nottingham?” my satnav-equipped and internet connected Mercedes responded with a digital shrug. By contrast, Siri on my iPhone coughed up the crow’s-flight distance in a trice. In short, MBUX is a lot cleverer than any other in-car voice control system I’ve tried but a dunce compared to the efforts of Apple, Google and Amazon in this sphere. 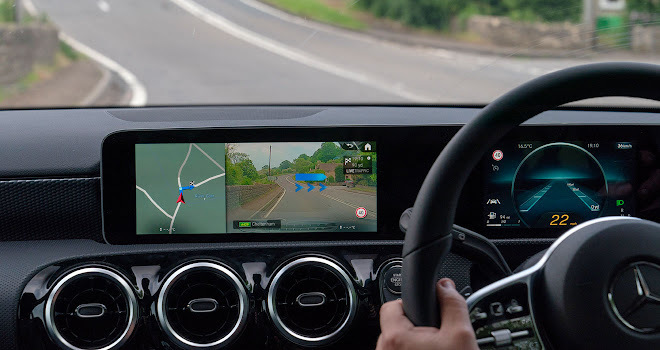 Another interesting option is the use of augmented reality for satnav directions. On the approach to junctions, most of the centre screen switches to a forward camera view of the road ahead, on which animated blue arrows are superimposed, telling you which route to take. It’s a little gimmicky but also, on occasion, helpful – though I’m not sure I’d pay the necessary £495 for this feature. 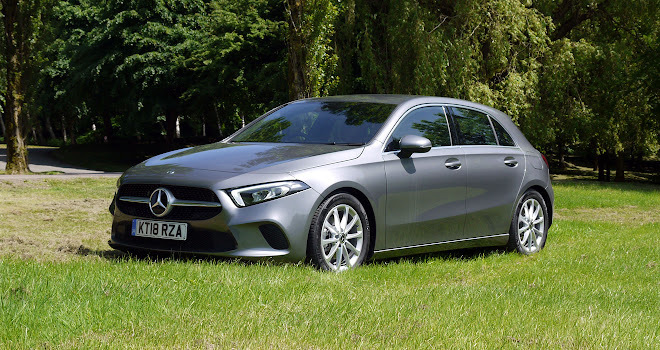 Initially the UK will be offered a fairly limited selection of A-Class variants to choose from: SE, Sport and AMG Line trim levels with a choice of three engines (two petrol and one diesel) and a seven-speed automatic gearbox. Other engines and a manual gearbox will follow later in the year. The diesel option (A180d) uses a 1.5-litre four-cylinder turbodiesel rated at 116 horsepower and 260Nm of torque, with a 108g/km CO2 score. It zips to 62mph in 10.5 seconds and costs from £25,800. The A200, priced from £27,500, employs a 1.3-litre four-cylinder turbo petrol engine offering 163hp and 250Nm, rated at 123g/km. It can dash to 62mph in eight seconds. Quicker still is the A250, which will sprint to 62mph in 6.2 seconds courtesy of its 2.0-litre four-cylinder turbo petrol engine, which boasts 224hp and 350Nm. The downsides being 141g/km of CO2 and a starting price of £30,240. Interestingly, Mercedes has fitted particulate filters to both its petrol engines. It’s a lesser-known fact that modern turbocharged petrol engines can be just as susceptible to creating harmful microscopic soot particles as diesels. Mercedes’ decision to fit filters doesn’t mean its engines are dirtier than others, just that it has done something to clean them up. While particulate filters are a legal requirement for diesel engines, the law hasn’t yet caught up with the issues of today’s high-power petrol engines. Overall, the new A-Class feels like a big step up from its predecessor. I found it better looking, much more comfortable over rougher roads, and with a more spacious feeling inside. 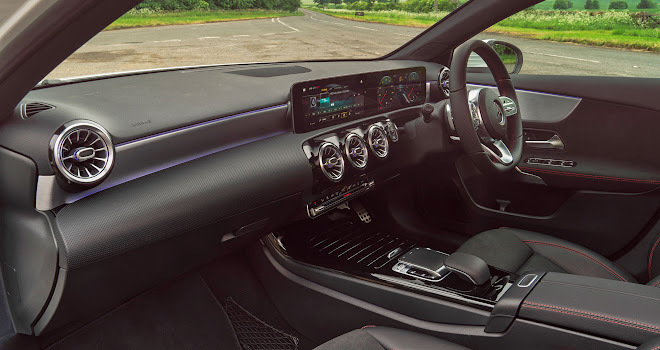 It also seemed more tightly screwed together than before, and its clever new multimedia infotainment system is state of the art, for car manufacturers at least. Downsides? Well, most of those are likely to start with a £ sign.